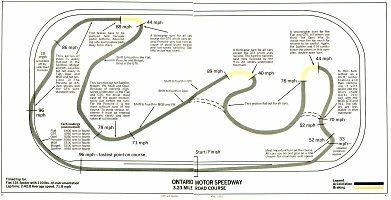 When Car and Driver set out to do a comparison test between 8 popular sportscars of the day, it was partly because of the SCCA's opening of a new class, called Showroom Stock Sports Cars. 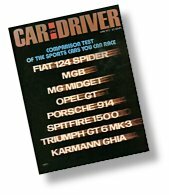 For that reason, the magazine editors chose the 8 cars they did; these are the cars that were currently legal for SS/SC racing. The cars ranged in price from $4,591 for the Porsche, to $2,789 for the MG Midget. Which car showed the most bang for buck? How did the Spitfire stack up? Well, not surprisingly, the Spitfire did not fare well in acceleration. In spite of the fact that Triumph had just outfitted it with the new 1500 motor, at 57 bhp, it was followed only by the Midget and Karmann Gia in horsepower. The Midget's lighter weight and slightly different gearing allowed it to squeak by the Spitfire, putting the Spitfire only ahead of the Karmann Ghia in acceleration tests. Interestingly, the GT6 surpassed every car in acceleration, and also provided the highest top speed. See the chart here. Even though at 79 bhp the GT6 did not have the most powerful engine in the group (the Fiat double overhead cam powerplant put out 90 bhp), its lighter weight and gear ratios gave it the advantage. But what the Spitfire lacked in power it more than made up for in cornering. Measuring 0.87g on the skidpad, it stood head and shoulders above the rest of the pack. Amazingly, it was one of three cars tested that did not benefit from the "new" radial-ply tires offered by most of the manufacturers, but rather bias-ply tires, which were still standard on some cars in 1973. The editors of C&D even gave the three fastest cars an extra advantage of the maximum legal-size rubber, from which the Spitfire did not benefit. (The GT6 did.) 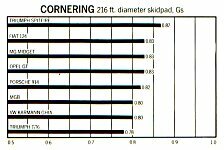 The next best cornering car was the Fiat, at 0.83g, and the worst was the GT6, at 0.78g; notably worse even than the rear-engined Karmann Ghia, at 0.80g. Of the GT6's handling, the editors wrote: "It is ponderous and unwieldy in a way that no sports car should ever be. ... And the basic handling of the car is not even that good. On the skidpad, this Triumph's cornering ability marked the low point of the test." Of the Spitfire 1500, the editors wrote: "The Triumph Spitfire is a changed automobile. Previous versions have earned it a reputation as a sports car that spends much of its time trying to tip over. But if any car has redeemed itself of past habits during this test, it is the Spitfire. ... That handling is fun to use even though the Spitfire's lap times are so far off the pace. The best thing about it is that it doesn't possess the tire-grinding understeer that plagues all of the other cars. The Spitfire is very close to neutral so you can thread around double-apex turns and through the esses like a demon slot car. ... The rear definitely jacks itself up as you groove through the turns and, as you approach the limit, the inside wheel starts a nervous chatter. But none of that is any cause to slow down. Just keep your foot in it. 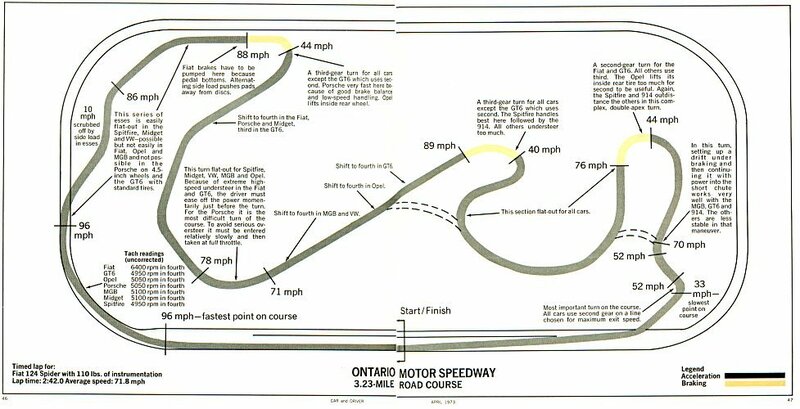 The Spitfire's cornering speeds are so high during all of this that you'll probably pass a car or two in the process." The difference between the Spitfire and the GT6 is described by the editors as "a white on black contrast." In summary, it would seem that if one wanted a great all-around road car, the ideal way to go would be to take a Spitfire and help it overcome its weaknesses, while retaining its strengths. The "quirky" swing-spring suspension works; it has been proven both on and off the track, and it was perfected with the 1500. If the stock suspension setup achieves 0.87gs, imagine what could be accomplished with proper performance tires mounted on wider rims, combined with gas-charged shocks and a beefed-up front sway bar. At this stage, this 25 year-old car could easily outcorner anything on the road, even by today's standards. But to keep this kind of handling performance, it would be disastrous to meddle with the car's almost perfect 50/50 weight distribution, as has been proven with the addition of the heavy 6-cylinder motor in the GT6. Given that the Spitfire's 57 bhp four cylinder motor is of a simple design, working it up to 90 or even 100 bhp is not out of reach, since off-the-shelf 100+ bhp motors for the street are already available. 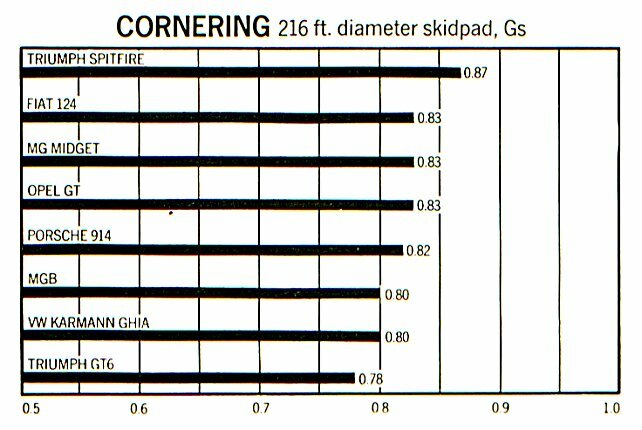 Providing the Spitfire with the same horsepower as the Fiat 124 Spider (the winner overall of the C&D test) would give it enough of an advantage to literally run circles around every other car tested.